NOTE: STARVING THE POOR AND NEEDY SHOULD NEVER BE A FIRST THING FIRST TO SOLVE ANY PROBLEM. To cut established family and social programs without first things first repealing the 1938 socialist federal minimum wage law is economic suicide. That is like using fingers to plug leaks in a dike, the cost of food buying power alone is gobbling up cash like crazy, and the one cent taxes here and there is adding up. And even worse our nuclear and extended family system, unlike in the past has been destroyed to the point it can no longer care for its elderly. I believe the USA culture and economic survival is now at stake and first things first must come first. That means the 1938 socialist federal minimum wage law must be repealed first if the USA is to have any chance of economic survival. UNLESS DRASTIC ACTIONS ARE TAKEN, GREAT WRITER FREDDIE LEE SIRMANS SENIOR SEES A DIRE FUTURE FOR THE USA, ALL DUE TO A LACK OF UNDERSTANDING THE CONSEQUENCES OF USING A FEDERAL MINIMUM WAGE LAW. In economic terms the amount of money means very little, it is the buying power that means everything, because that is what determines the cost of living. Sixty-eight years ago $5.00 would buy more back then than $100.00 will in today’s money, which is all due to the 1938 socialist federal minimum wage law. Everyone understands the life and death cycle, but what so few understands is every economy has a built in boom and bust cycle, which is not so dangerous if a society has a strong healthy nuclear and extended family foundation with emergency backup bartering power. And when the busts cycles are allowed to occur frequent enough not to let the negative anti-survival forces in an economy grow too powerful. Purges is what keep the boom and bust cycles manageable by not allowing them to grow too powerful. Even too much of a good thing can become dangerous, balance is always the key. But, a minimum wage law blocks a free market economy’s ability to fully purge and complete the bust cycle by getting rid of over powering negative anti-survival forces. Once a minimum wage law blocks the purging process in a free market place economy the economy has no way of protecting itself or disciplining society, then things like insane extreme liberalism is loose upon the land with no physical barrel left to stop it until it self-destructs the whole nation. 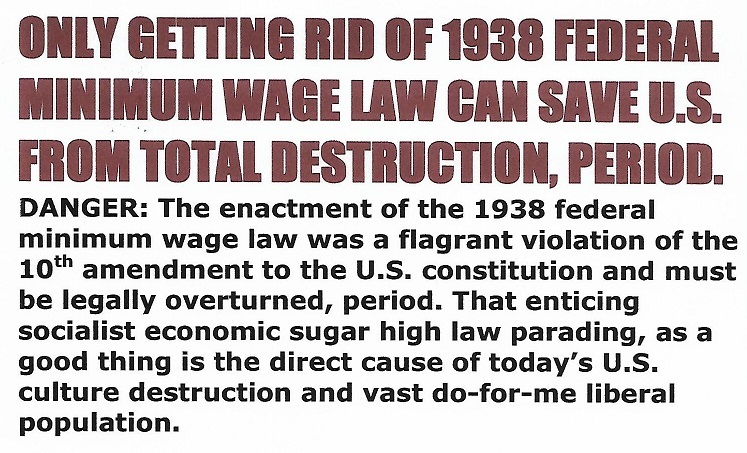 All that is necessary to save the USA is to repeal the arch-evil 1938 socialist federal minimum wage law, period. As a self-made writer, I can only give my one-man opinion on the desperate determination to take down our legally elected president by the liberals. God don't like ugly, and when you dig a ditch for someone else to fall in you may end up falling in it yourself. When you change yourself you change the world around you. Stay positive, even if you don't like someone or what he or she stands for, still wish him or her goodwill anyway, then any hate or tension will go away. Anyone you dislike and can't stand on your job or anywhere just repeat to ones self, "I can wish all people goodwill even if its not returned", and repeat it as long as necessary, then any bitterness, stress, or tension will go away forever. Trying to take down the president by hook or crook is more than taking down one individual, that is trying to take down a legally elected constitutional institution, which the whole nation was built upon and so many have fought and died for. God save my beloved homeland, the only home I know and love. FREDDIE LEE SIRMANS LOG: 14 APRIL 2018, 0111 HOURS. TO CONTINUE SCROLL TO VERY BOTTOM AND CLICK ON "OLDER POST"